DormCo takes dorm bedding seriously. Your dorm bed is the largest area you have to decorate in your college dorm room, which means it is a huge addition to your dorm room decor. Here at DormCo, we don't believe in skimping on style or comfort. All of our great College Comforters have both style and comfort to add to your dorm room decor while keeping you comfortable night after night. After all, getting a quality night's sleep is integral to your success at college. With DormCo's great selection of Twin XL College Dorm Bedding, you can rest assured you will get the quality night's sleep you need. From Plush to Microfiber and Cotton and Twin XL and Full/Queen sizes, you're guaranteed to find dorm bedding you absolutely love here! A College Comforter is a dorm essential on the top of your college dorm checklist that you will need in order to start college right. 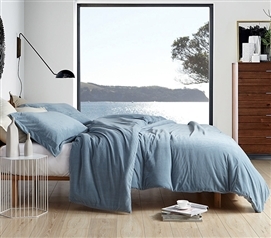 We offer a variety of fabrics and styles so you can find exactly what you want and need in order to have a quality night's sleep every night in college. 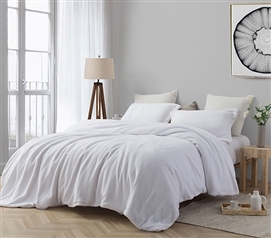 We offer Twin XL College Comforters, but we also offer a selection of Full/Queen Comforters for College for college students that have a college apartment. Find exactly what you love here at DormCo and have great college dorm bedding that adds to your dorm room decor while keeping you comfortable!